I can’t believe I haven’t done this since 2014! 2017 is up next I’m going to do the 52 week money challenge again. Whose with me? Below are some more details but I want to know who wants to join me? I know several of you on Powered by Mom’s Facebook page the other day said you were going to do it so let’s do it together! I’ve already done my first week’s deposit for 2014 a whopping $1 :). Whether you’re making new year’s resolutions or not this is a great way to save a bit of money that for the most part should’t be to hard on the wallet. Obviously the 52 Week Challenge is based on 52 weeks in a year so you start with putting $1 into your savings account, then $2 on week two, $3 on week three etc just like the picture above indicates. Doing it this way you will save a total of $1378.00. Some of you on our Facebook discussion mentioned that you’re going to do this backwards starting with $52 as some find money much tighter near the end of the year right after Christmas. I think either way is a fabulous idea. So who wants to join me? Leave a comment below and let’s encourage each other. I will be posting either here or on Facebook once a month to say how I’m doing and we can all check in and encourage and support each other! « Adorable Ruby Crystal Fair Pendant Necklace ONLY $1.59 Shipped! This works so good, have done it 2 years in a row and it makes it so easy to have Christmas and December birthdays!! What a great idea! I don’t think I’ll be able to do it this year, though, since we’re trying to close on a house and every dollar needs to be accounted for. Maybe I can start at the six-month mark, which would still be something. Sorry no pennies even to spare here!All my income goes to rent and utilities! at the local credit union they gave us this idea i love the end result but im just not sure i have the will power! might be a little less at end of year but will definitely increase our savings! I have been looking for this …I am so glad I found it here …I am so doing this …Thank you!! Sounds awesome! I’ll give it a try too! I love this money-saving challenge! I am do doing it! Nice and easy way to save up for xmas shopping in December! Saving money for a year by breaking it down into 52 weeks of much more manageable blocks is a wonderful idea. I’m in, but am a little behind, so I will have to start out at a dollar and save more each week. Thanks for sharing and for providing support. This sounds great. Will have to try! I’ll join you. Will share with my husband so he can help keep me on track. Thanks for the inspiration! Saving money is a good habit! This is a good idea, but unfortunately the way finances are here, would be robbing Peter to pay Paul. I am really going to try and do this! I have been seeing this and I really want to do this challenge! This is very appealing to me. I would like to try it. I know that I could do it for awhile, at least. 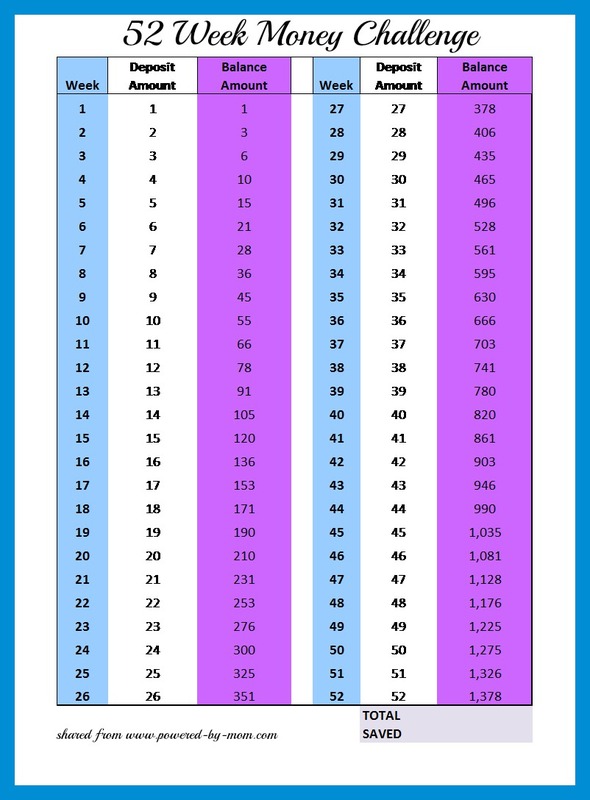 Even though I’m a few days late to get started (it”s easy to catch up during the first week) I’m taking advantage of this EASY chart AND looking forward to having SAVED those $$$ at the end of this year. Thanks for the chart !!! You are very welcome Yvonne and good luck! you are so welcome Carol! I think instead of putting it in a savings account i’m going to do the challenge on one of my debts for repayment. Great idea and will help me knock my debt down! Love this idea and implementation, Michelle. Let’s do it! It sounds like a great way to get started saving money! I’m thinking of joining along! It sounds like a good way to save money. This is a great way to start the habit of saving! My husband and I started saving years ago with $20 per paycheck. Every time he got a raise we increased our savings instead of spending it. We also set it up to be automatically taken from checking when he got paid and transferred to savings. we are doing this but were worried that we might not be able to do the larger amounts in Nov and Dec of next year so what we are doing is taking the amounts and writing them on slips and then each week we will pull a slip with the amount we are comfortable saving. This allows for some flexability if we have an unexpected bill during the year or a smaller paycheck. We started with the largest amount $52 on Friday. I love this idea and seems easy enough to do. I wanted to try new things this year, so this was just added to my list. Thanks! I’ve seen this a few places, such a great idea. I really should try doing it! I started on the first, I can do this! I have a friend who is doing this challenge along with a meal list for 3 months. I may try this to save for a vaca!